Our numbers-focused alumni consider how to invest pension funds, what benefits employers can afford, whether a financial institution should offer a particular service, how much life insurance to recommend, and how to meet payroll. 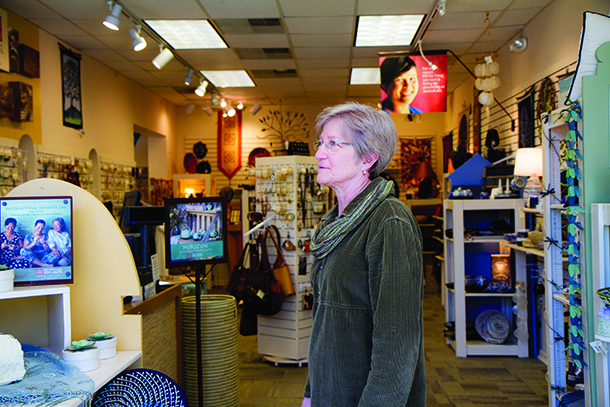 They support enterprises that provide jobs and, in some cases, they contribute to decisions about layoffs. They serve as private and government auditors, making sure money is going where it should be. They guard against embezzlement and arrange for taxes to be paid. They help municipalities to find the funds to meet common needs – or deliver the news that adequate funds don’t exist. They are, in short, players in matters that affect the well-being of nearly all of us. As an overview for this “numbers” issue of Crossroads, we’ll offer some thoughts pertaining to money, give much-deserved credit to Mennonite Economic Development Associates (a group which is not just for Mennonites! ), and finish with insights from nine alumni and one long-time professor. In God, Money, and Me – Exploring the spiritual significance of money in our lives (2004), Edwin Friesen wrote: For various reasons, talking about how we personally manage money is frequently a social taboo. Some people struggle with overwhelming debt. Others feel unworthy of or burdened by their wealth. Still others feel entitled to what they have and don’t want to be challenged. We fear each other’s judgment as we voice our opinions. But talking about money with fellow believers will reduce its power over us. Together we can seek to put money in its place, a place where it serves as a tool for God’s purpose, not as a god that rules us. 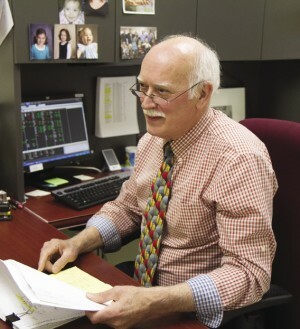 Friesen mainly focuses on individual financial choices in his 83-page booklet (published by the Mennonite Foundation of Canada, available from Everence). He acknowledges Christians’ traditional discomfort with amassing great wealth, summed up by 1 Timothy 6:9-10: “For the love of money is at the root of all kinds of evil. And some people, craving money, have wandered from the faith and pierced themselves with many sorrows.” And what about the three biblical passages that say, “It is easier for a camel to go through the eye of a needle than for a rich person to enter the kingdom of God”? Yet we all need money, even if we’ve been warned not to love it, not to crave it, and to beware of being rich. So how to strike the right balance between meeting our needs – and those of others – without becoming obsessive about money and making it a false god? Here at EMU, it took money to build this institution, with much of it coming from successful business people like Jacob A. Shenk, who attended Eastern Mennonite School in the 1920s, or from generous professionals, like eye surgeon Paul R. Yoder Jr. ’63. And it will take continued infusions of money – some of it arriving in large chunks and some of it tallied from many smaller donations – to enable EMU to have the necessary facilities and financial aid to keep producing alumni who are doing good in all walks of life and professions. Friesen suggests that most of us need prophetic-spiritual voices, such as Mother Teresa with her vow of poverty, to encourage us “to ignore the all-pervasive cultural influences to buy and consume” and to instead “focus on sharing” and on one’s “relationships with God and others.” And yet Mother Teresa welcomed donations from supporters who had not taken her vow of poverty. For instance, she received $1.25 million from Charles Keating, a key player in the meltdown of the savings and loan associations of the 1980s, where about 23,000 customers (many of them retirees living on pensions) were left with worthless bonds. Asked to return the money to those from whom it had been stolen by Keating’s company, Mother Teresa declined to respond to the official request from a U.S. government lawyer. Yet she did send a letter advocating leniency for Keating when he was facing a prison sentence. In short, even Mother Teresa faced messy challenges in terms of money – where it came from and how it was ultimately used. Longenecker’s father ran a small retail store near Harrisburg, Pennsylvania, when he was growing up – which is where he got his foundational lessons in how to approach work, treat employees, and make decisions with integrity. Thequestion, “Why do we do what we do?” was always in the air. And the answer was not simply: “We do it for the bottom line.” In Leola, Pennsylvania, Thomas Verghese ’71 runs his own insurance and financial services firm (with the help of assistant Rebecca Bucher ’86). 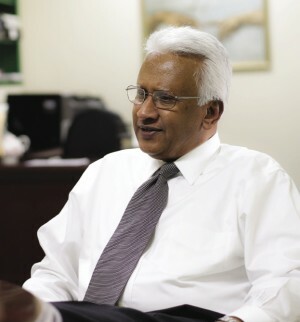 Verghese took the unusual step of topping off an MBA earned at James Madison University in 1974 with a year back at his undergraduate alma mater, studying at Eastern Mennonite Seminary (EMS). “Faith and values are paramount in my dealings with my clients. My training at EMC, the year at EMS, my church (Forest Hills Mennonite), and the faith community that I am a part of have provided me with a sound foundation upon which to live and work.” Specifically, as an “independent agent” who can pick and choose among products offered by various companies, Verghese says he takes care to “make sure that the recommendations I make to my prospects and clients are in their best interests in terms of suitability, cost, quality of the product, as well as timing.” Andrew “Andy” Dula ’91 is the CFO/COO of EG Stoltzfus, a construction company based in Lancaster, Pennsylvania, with 25 subsidiary companies. He is also chair of EMU’s board of trustees, a volunteer position. 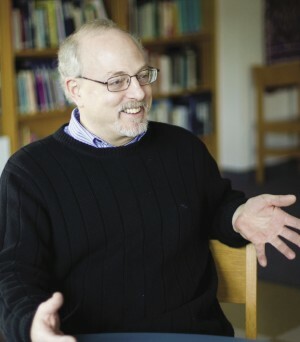 For Dula, what truly counts are the “stories of making just choices, going the extra mile, treating employees as partners, emphasizing our interconnectedness instead of untamed individualism, and practicing moderation instead of excess,” adding that these “are part of who I am becoming, rather than anything I am doing.” C. Conrad Martin ’80 returned to his home state of Pennsylvania in 2001 after spending 12 years working in Africa (Tanzania) and Asia (Bangladesh) on accounting, microfinance, and job-creation projects for several church-affiliated organizations. Along the way, in 1991, he earned a master’s degree in economic development. After his return to the United States, Martin discovered a fellow graduate from his era, Josephine Histand ’81, who had gone on to get an MBA and to work for the Ford Motor Company. “It was an online match. We overlapped a couple of years at EMU – I avoided the library and she lived in the library, so we didn’t meet then,” he says with amusement in his voice. The two married in 2001, and she now works as an environmental engineer consultant. “My philosophy has always been that I feel best when I am where God wants me to be,” he says. “The common thread [for all of his jobs] is that I was working for the church. I have liked whatever setting I was in. I am not looking to be a CEO of a non-profit. My first priority is to be of service to the church.” Today he is director of finance for Franconia Mennonite Conference, handling a budget of approaching $1 million annually. He and Josephine attend Blooming Glen Mennonite Church. Like Conrad Martin, John Hess-Yoder ’74 spent a chunk of his young adult years living and working in foreign locales – two years in Laos and three years in Brazil under Mennonite Central Committee. He then pastored a Mennonite church in Oregon for three years before deciding to enter the financial planning arena. Hess-Yoder is a Certified Financial Planner, plus he holds a law degree earned through night school. The CFP is not a one-shot deal, Hess-Yoder explains. “You have to do special ethical training per year and you have to sign ethical guidelines. You can be censured by them [the Organization of Financial Planners, which confers the CFP] for quite a few things that regulators cannot get you for.” If Hess-Yoder were a customer seeking a financial planner, he says one of his first questions would be, “How independent are you?” He would not be comfortable with planners who receive commissions or extra compensation based on promoting certain funds, including in-house ones. “My best relationships are fee-based,” he says, in the manner that a lawyer is paid a fee for a specific service rendered. He adds, however, that some clients opt to have him compensated on a commission basis, which may save them money under certain circumstances. An up-and-coming associate of Hess-Yoder, Kyle Mast ’07, hopes to pass his CFP exam in the summer of 2013. Like Hess-Yoder, he prizes being an independent financial advisor: “I am not tied to anyone’s investment products. 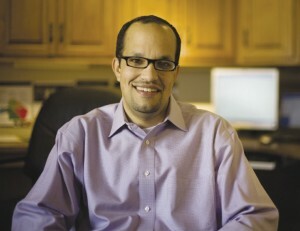 I can offer what I believe is best to my client, no matter what.” Mast says that half of his clients ask him to help them choose “socially responsible investments” (SRI) – though these entail higher management fees because of the labor that goes into carefully screening companies – and half simply want him to focus on investments that are likely to have the best returns. Mast credits Everence, the financial-services arm of Mennonite Church USA, with doing one of the best jobs of screening companies: “There aren’t many who do the due diligence that Everence does,” he says. The current “hot button” among his SRI-focused clients who are Mennonites? Avoiding companies associated with arms manufacturing and marketing. Larry Nolt ’65, an investment manager with National Penn Bank Shares headquartered in Allentown, Pennsylvania, says “fiduciary advisor” is a term coming into vogue. The word “fiduciary” highlights the difference between those professionals who are legally obligated to put the needs and interests of their clients first – such as chartered financial planners, chartered financial consultants, and chartered financial analysts – and others. Stockbrokers, for example, usually work on high commissions, benefit from frequent transactions (whether necessary or not), and receive outside incentives, such as trips paid by the companies whose funds they sell. Nolt suggests that prospective clients of financial services ask for “full disclosure” regarding how their advisors or planners will be compensated for their work. It may be difficult to tease out hidden charges, such as those that may be contained in insurance policies or annuities. Remember, he says, “if a product or investment sounds too good to be true, it probably is. I wouldn’t go there.” Just as most of us need to partner with healthcare professionals to stay healthy, Nolt believes that the average person needs the expertise of a well-trained, highly ethical financial advisor to manage their money. And even these advisors can get it wrong. “Almost all of us [in the field] were buffaloed by Enron,” he says. You have to have strong regulatory bodies keeping watch, he adds, “because the crooks always move to the latest area of de-regulation.” Part of the beauty of living a “discipled life” as a Christian, and as a member of a church community, says Nolt, is receiving help to curb the human tendency to take advantage of situations and to reach for the utmost profit, regardless of the cost to our fellow humans. “I view business as an agent for extending God’s providential care to humankind,” says Spencer Cowles, PhD, chair of EMU’s business and economics department. “Business is simply a way of producing and distributing the things we need. Making a profit is a means to that end. “As a stockholder, I want my companies to do well financially, but I also want them to contribute to the social good.” If there was a common thread among the dozens of interviews conducted for this issue of Crossroads, it was this: We are called to be stewards of our resources, financial and otherwise, rather than being heedless gamblers with them; we must always consider the wider impact of the financial decisions we make. — Bonnie Price Lofton, MA ’04 1. Leap has a “Valley family.” His wife, Renée ’85, is associate director of EMU’s financial assistance office; his elder son, Mitchell, is a 2012 graduate of EMU, and his second son, Parker, is a sophomore at EMU. The family worships at Harrisonburg Mennonite Church.